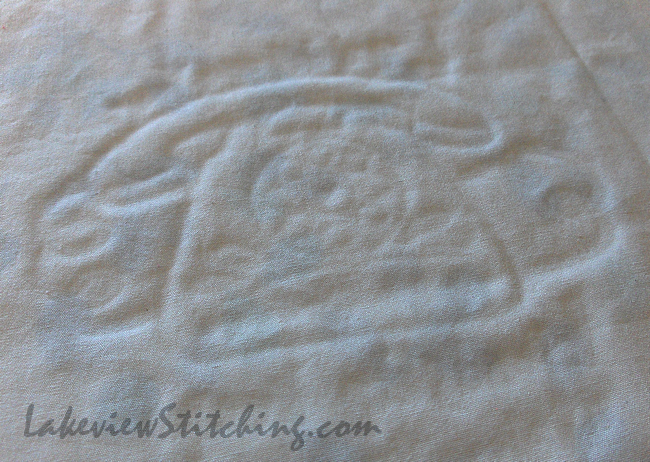 Last time I posted about Best Friends Forever, I said that 23.5 of the stitcheries were done. 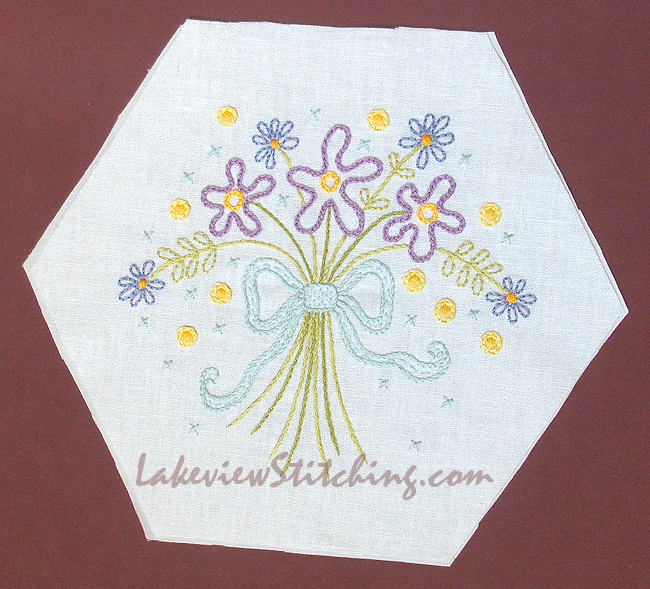 Before I did the final wash and cut, I decided to finish up that last ".5:"
I used the acrylic cutting guide from Paper Pieces to centre each stitchery on the 3.5" hexagons I'm using for the setting. It turns out that these two motifs, the basket and the house, were printed too close together. 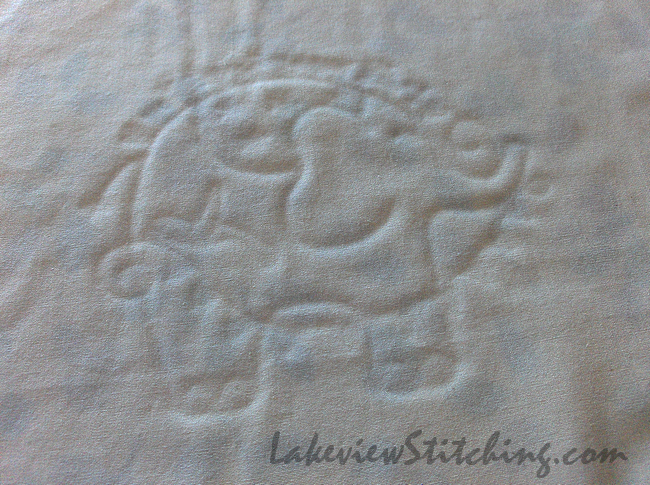 It's the only place I had this problem for the whole quilt -- usually there was 1/2" or more in between. I'm not upset, because I wasn't a big fan of the basket anyway. When I stitched it I worried that it was too big, which it isn't. But I guess I knew something was wrong! Cute, eh? Even the grunt work has been fun on this project. I miss stitching these, actually. It was fun to come up with different stitches and colours for each one. 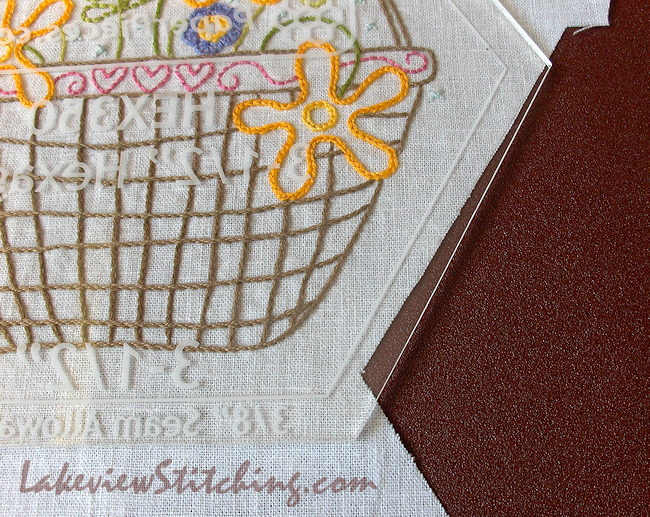 The stitching for Down in the Garden, which I'm doing now, is not as challenging and is starting to feel dull. I may need to add something else to the mix! As fun and exciting as this all looks, I'm not sure I can work on this and Texas Star at the same time without a total English paper piecing overload. And I've kind of set myself a schedule for Texas Star... So it may be a while before you see any more. Is it different than you thought? They are 3.5", 5/8" and 1/2" hexagon centres, respectively. I should have put a ruler in the photo too. Anyway, lots to do! 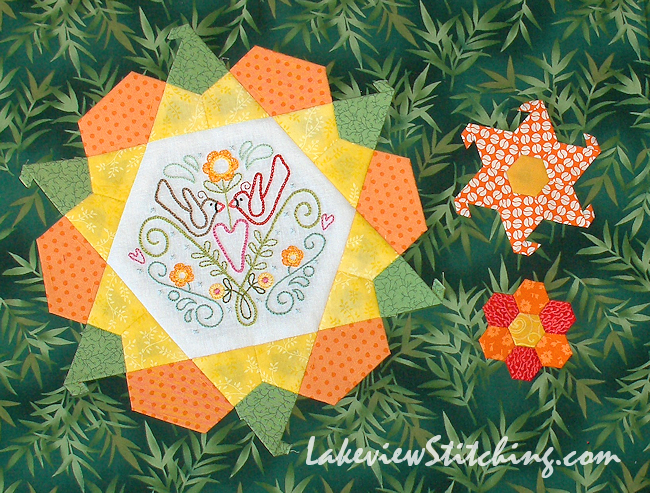 Your BFF blocks are beautiful and I love how they are pieced! How frustrating that the basket block was too small - even though you don't like it I think it is very pretty! Such a fantastic set of blocks. 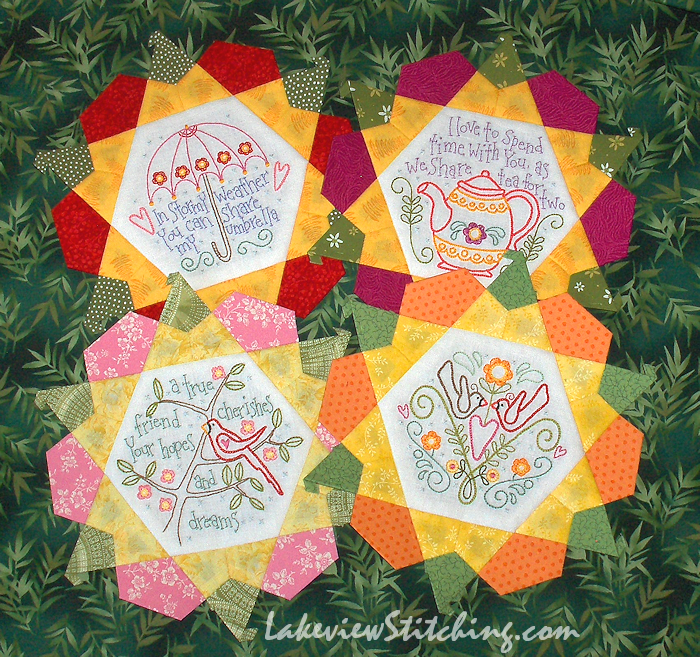 I can see why you would miss stitching on them, but they will be an amazing quilt. I think you can make that basket block work with some serious fudging. My early days of piecing had a lot of this in it. I hope you weren't going to ditch this block. My, the colors really pop with the fabrics you have chosen to surround them with. Just as I was thinking ' I've lost my sense of scale here - I remember these blocks as large' you stepped in and helped out! Felt as if you were reading my mind! I really admire the way you get the right framing for your work. You have a great eye. I'd be with Mary Ellen above, but I admire and understand your precision. Thank you, Jillian! The problem with the basket block just made the decision easier, because only 22 stitcheries will fit in the final layout. 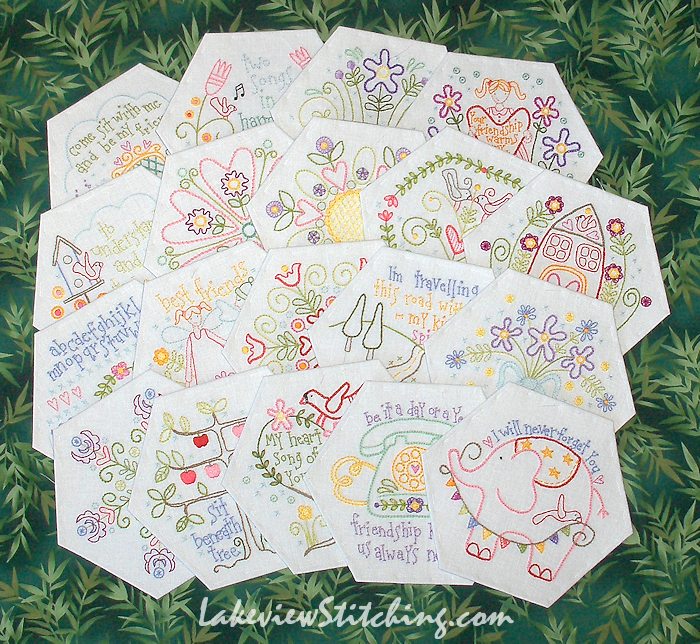 There are 23 stitcheries in the photo above, and once I laid it out with all the "petals," the big purple flower in the top row was also eliminated to give me the best colour balance. It was nice to have a choice! Shame about the few that were off centre but so loved watching you stitch this project. Love the fabrics going around them too. One gorgeous quilt evolving.